ABOUT THIS PRESS CONFERENCE: While arriving in Chicago during the Beatles' 1964 North American tour, a decision was made by someone outside of the Beatle camp to change the landing site of their airplane to a more secretive spot on the airfield. This last-minute change would end up disappointing the large crowd of devoted fans who had waited many hours for a chance to see the Beatles at the airport. The Beatles felt they were being incorrectly blamed for the incident by reports in the Chicago news, and sought to set the record straight. 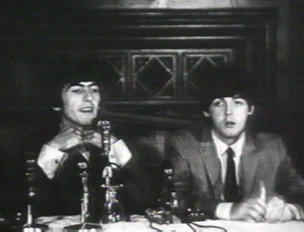 This press conference was held at the Stockyards Inn on September 5th 1964 before the Beatles performance at Chicago's International Amphitheatre.